One Part Scissors was approached to brand a new company, Josic Wrap Doors. We created a logo (see more about the logo here), website and magazine advert for the fledgling business. The magazine advert was designed for the April 2009 issue of Homemaker's Faire. The Homemaker's magazine is a very busy publication with many adverts, so a strong, clean layout was used to ensure it would stand out in the crowd. 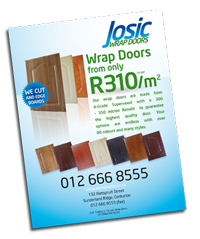 The affordability was a major selling point for the product, and so the 'Wrap Doors from R310/m" is a focal point on all items, from the advert, which it boldly takes up a third of the advert, to the website, where it can be found on all the pages of the site.